John Moore/Getty ImagesFormer President Bill Clinton speaks at the closing session of the Clinton Global Initiative last week. 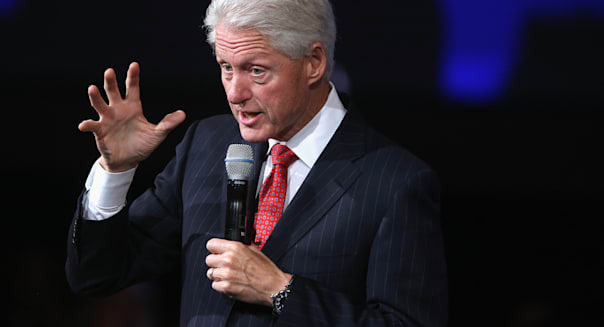 For former President Bill Clinton, host of the annual gathering of business and political leaders at the Clinton Global Initiative, the American economy isn't feeling as secure as it should. Median household income in 2013 was $51,900, according to recent reports from the U.S. Census Bureau, 8 percent lower than before the recession began in 2007. During the Clinton presidency from 1993 to 2001, median family income in the United States rose to $49,000 from $37,000. "Median income hasn't gone up for three reasons," Clinton said. "One is the labor markets aren't tight enough, and we haven't raised the minimum wage as we should. And the second reason is we haven't changed the job mix enough, to raise the median income and have more poor people working into it. The combination of jobs has to pay, on average, higher wages." Clinton said he believes the current business climate is also to blame for income stagnation. "Gross domestic product growth doesn't lead to growth in median incomes because company after company takes more of its profits and spends it on dividends, stock buybacks, management increases ... and less on sharing it with the employees broadly," said Clinton, who is hopeful that corporate America is poised to change that view. While Clinton said he hopes that corporations refine their moral compass, he also hopes Washington will act when it comes to the debate over whether tax inversions -- the practice of American companies reincorporating in foreign countries to take advantage of lower corporate tax rates -- are right or wrong. "America has to face the fact that we have not reformed our corporate tax laws when 100 percent of the people, from Democrats, Republicans, Independents, agree we need to," Clinton said. "We have the highest overall corporate tax rates in the world. We need tax reform." When asked if he knew any politicians expected to participate in the 2016 presidential election and campaign for an effort to reform the tax code, the 42nd president demurred.